"Spring into the season's latest offerings!!! Original arts, crafts, unique gifts...all within the beautiful Waxahachie Civic Center. Preview March 14 from 5-7:30 pm; Sat/March 15 from 9 am - 6 pm; Sun/March 16 from 9 am - 4 pm. Admission $8; kids 12 & under free with paid adult. Free photo op with the Easter Bunny!!!" Admission is $8 per person, kids 12 & under free w/paid adult. Booths are 10 X 10 and cost $225 $200. Booths are currently on sale for 50% off! To apply, click on the payment button here, once purchased, please email the coordinator (info below) with the name of your booth, and brief description, photos are encouraged, as we will post them on our Facebook event page. If you purchase a booth and your items are not approved or if they already have a rep, such as Scentsy, your booth space will be refunded immediately. All booth purchases are final, no refunds. Tables, chairs and electric are available at additional costs. 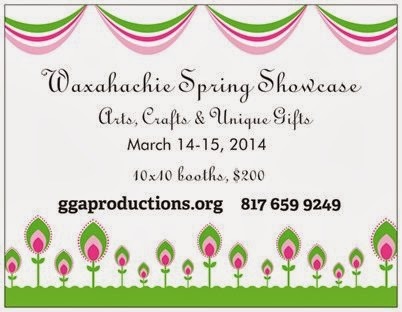 For more information, visit their website, Facebook Page, or contact their event coordinator at ggaproductions@yahoo.com / 817 659 9249 / waxahachieholidayshowase@yahoo.com.